Farm CB Radio , So, whats involved in getting set up with CB? 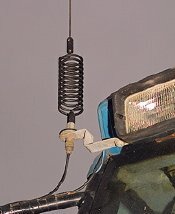 Farm CB Radio So, whats involved in getting set up with CB? The actual equipment needed for a CB system is very simple - you need the CB itself, an aerial with attachment to the body of the vehicle and a cable connecting it to the set - thats about it! Most of the CB sets available run from a 12v-14v supply - although there are 24v/12v CB's available now, which automatically sense the supply voltage and will run on 12v or 24v systems. - Ideal for 24v vehicles or if you want to use one CB for a number of machines, and swap the unit between them. If you have a 24v vehicle, you could either go for one of these, or use a Voltage Dropper - these change 24v to 12v to allow you to run a 12v CB and/or car stereo and other 12v equipment. The aerial is really the most important part of any system - it makes all the difference to the range you will be likely to get. As a general rule-of-thumb, the larger an aerial is, the better it will work. It should be mounted so that it is not close to any object, and has clear space around it - ideally being the highest thing on the vehicle. We give specific farm vehicle installation advice here along with our main Installation Advice Section here, which although aimed at installing in Land Rovers and the like, is largely just as applicable for tractors and other machinery, as well as normal cars, vans and lorries. Modern farm machinery can present a few complications, but these can easily be overcome and in general, installation in farm vehicles should be pretty easy for even the most non techincally minded. The aerial needs to have a "ground" connection, i.e. a part of the aerial mount will be designed to make metal-to-metal connection with the vehicle it's fitted to. This can be difficult when cabs are made of fibreglass or composite materials and there is little metal to make this connection with. You can get around this by using an artificial ground Electronic Ground Plane which does-away with the need for a metal to metal connection. This means that a hole or bracket on a fibreglass cab will work fine as an aerial mounting. The EGP can be mounted on a plate, bracket, one of our mirror/bar mounts or simply through a hole in a panel. Make a small bracket coming off your lamp brackets or mirror arm bolts, and using a stud mount there is also a common method (see photo). If you have conventional gutters to the cab, and a metal cab roof, you could use a Gutter Mount. Magnetic Mounts can be a good solution if you have a metal cab roof or another flat metal surface. This can include front weights, bonnet, rear wheel arches, or almost anywhere metal (not aluminium - magnets won't stick to aluminium). As long as you have a decent quality mag mount, and use a flexible aerial, it should stay on fine even when hit by branches etc.